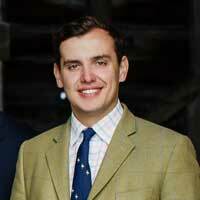 Sebastian studied at the Royal Agricultural College, Cirencester and trained with some of the leading land agency firms in the country. He is a Fellow of the Royal Institution of Chartered Surveyors and a Fellow of the Association of Agricultural Valuers. He also holds a number of Directorships for several of his client’s management companies. Sebastian spent several years as a resident land agent and is currently involved with the management of almost 50,000 acres throughout the country including some of the country’s most prestigious upland sporting estates. He also specializes in the management of large and small country houses as well as acquiring property on behalf of clients. He also currently manages several large forestry portfolios. He has over 15 years of rural property consultancy experience including the management of an internationally famous garden attracting over 100,000 visitors annually. He also currently works alongside and advises a number of other property professionals. Pippa also studied at the Royal Agricultural College. She is a Fellow of the Royal Institution of Chartered Surveyors and a Fellow of the Central Association of Agricultural Valuers. Pippa trained as a land agent on the Lowther Estate in Cumbria before joining the Forestry Commission in North Yorkshire and Cumbria managing their rural property portfolio. Pippa has over 14 years experience working in the telecoms industry specializing in rent reviews, lease renewals and securing site sharing arrangements with landowners throughout the country. In addition to her estate management and telecoms work Pippa also advises landowners on agri-environment scheme applications and she is a registered FEP (Farm Environment Plan) Surveyor for Natural England’s Higher Level Scheme. She has been awarded the BASIS certificate in Conservation Management. Helen deals with all aspects of management accounting at Greens. She is a member of the Institute of Agriculture Secretaries and Administrators, Institute of Certified Bookkeepers and a student member of AAT where she is currently extending her qualifications. She has over 9 years’ experience dealing mainly with agriculture and country based clients, which sits close to heart as a farmer’s daughter. George studied at Harper Adams University and is a member of the Central Association of Agricultural Valuers. He previously serviced retained farm management clients in the South of England for a leading UK agricultural consultancy firm, providing strategic, financial and technical advice to landowners, farmers and related businesses. Additionally, one off work included rent tenders, working with contract farming agreements, Basic Payment Scheme matters, Countryside Stewardship and a number of other rural grant scheme applications. George works alongside Sebastian and Pippa, assisting in all areas of estate management work and has a strong interest in sporting matters. We pride ourselves in being able to help where we can. If we cannot, we say so. Ensuring our clients get ‘best value for money’ is paramount to us, as is providing a top notch, quality, professional management service. For further information or an informal discussion, please contact us.